While watching the season premiere of Mad Men last week I was once again really struck by the amazing attention to detail from costume designer Janie Bryant. I love reading interviews with her about where and how she sources the costumes for the show and how there is a story behind all of the pieces. Talk about a dream job! I mentioned on my facebook page a few days ago how much I loved the sunglasses Megan Draper wears in Hawaii at the beginning of the episode, I also loved her make up throughout the episode and particularly the white nail polish she wore on New Year's Eve. So I went out in search of an opaque white nail polish and found Matt White by Barry M.
I think this is such a great shade for all year round, Summer or Winter. White doesn't seem to be a nail colour I read about or see on blogs at all really so I wanted to share how I got on with this one. I was worried this was going to look like Tipp-Ex on my nails but the colour is really nice and not as in your face as I thought it might be. It's not matte as the name suggests, but actually quite glossy and fully opaque after 2 coats. The formula is a little thick for my liking but for €4.59/£2.99 I can't really complain too much. These are available from the Barry M site and in Boots. 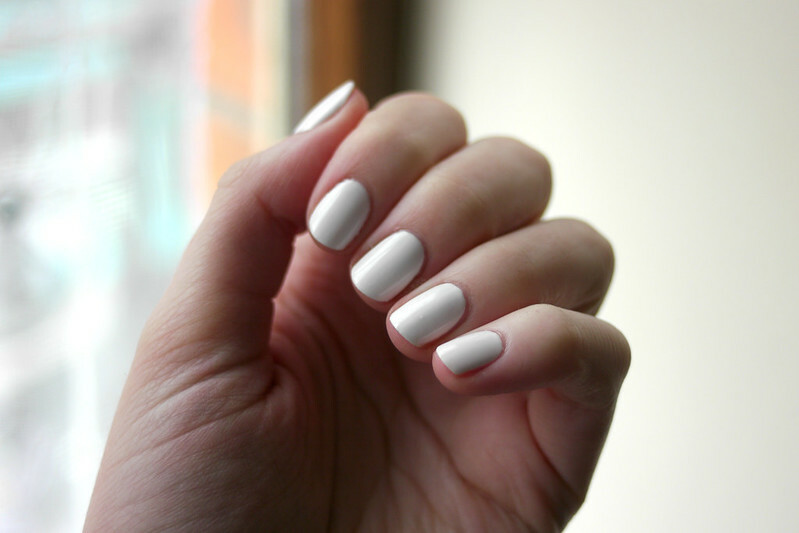 What do you think of white nails? More importantly what did you think of Mad Men? Hi, Emma! You know that I am a huge fan of Mad Men, but I need to confess that I haven't yet tuned in for the new season. Mrs. Shady and I are working our way through a number of vintage shows and new Hulu originals and we just haven't found time to view the latest Drapers' capers. We will, I promise you! I love this smart neutral shade of nail polish and agree that it would work all year 'round. Dear Emma, I have a very important blog post coming up this Thursday, April 18. Please mark you calendar and try to visit that day. You will have an opportunity to make someone very happy. Thank you, dear friend! Maybe that's how I can get away with it because I'm so pale! maybe you could try a pearly white instead of opaque. I LOVE this shade on you, looks so sophisticated! Thanks! I love it so much, don't know why I've never tried white polish before! p.s. I'm having a Bonlook sunglasses/glasses giveaway if you'd like to check it out! I wasn't sure how I'd feel about this but OMG, your nails look AMAZING Emma. How did you get it so smooth?! My fear with whites is that they'll go on streaky and uneven but these look so chic. Bravo! I was afraid that it would be really translucent and I would need 5 coats for full opacity but it wasn't streaky whatsoever. Very impressed!